Saint-Germain-en-Laye dates back to the Middle-Ages. The town has kept the original urban layout of the time it was the seat of the royal government under Louis XIV. At least, the old town of Saint-Germain has retained over the years the charming appearance of a French provincial town. The old town of Saint-Germain stretches West of the castle. The main street is Rue de Paris which leads to the busy place du marché. Lateral streets offer a more tranquil atmosphere (place St. Pierre, Cour Larcher, rue du Vieil Abreuvoir). From its foundation around 1124 to the departure of the Louis XIV’s Court to Versailles in 1682, Saint-Germain-en-Laye was one of the favourite residences of the French kings alongside Vincennes, Fontainebleau and Compiègne. 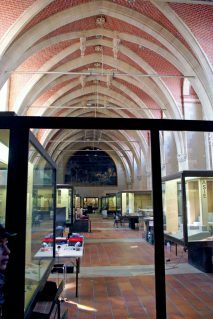 The castle of Saint-Germain-en-Laye houses the National Museum of Archeology. The museum stores the world’s largest collection of prehistoric art. 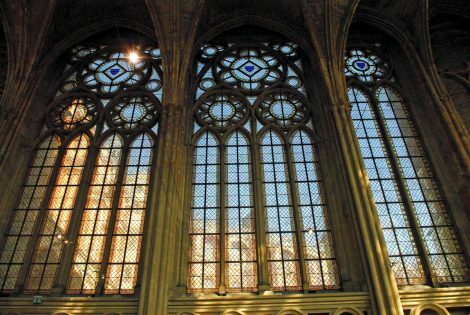 The Sainte-Chapelle in the castle – of Rayonnant Gothic style – is worth a visit. 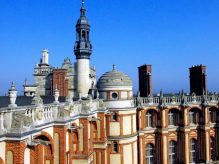 Find out more about the Château-Vieux of Saint-Germain-en-Laye. The present parish church of Saint-Germain-en-Laye was built in 1827. It is the fourth sanctuary to have been built on the site since 1028. In the beginning of the 18th century it was known as ‘Saint-Germain-de-Paris’. The church is now dedicated to St. Germain and St. Vincent who founded the town at the beginning of the 11th century. Find out more about the church of Saint-Germain-en-Laye. The old town of Saint-Germain-en-Laye boosts many winding streets. They are reminiscent of the Middle-Ages and Renaissance eras. One my favourite streets in Saint-Germain. It is bordered by some fine townhouses (hôtels particuliers). The picturesque rue de la Salle connects the castle to the heart of town. It takes its name from several commanding officers of the castle. The street dates back as far as 1542 and is one of Saint-Germain’s oldest streets. At number 14 is the half-timbered façade of Saint-Germain’s oldest house (16th century). These very old streets have kept their French provincial atmosphere with many shops, boutiques and restaurants. The long shopping street of rue du Vieux-Marché is the backbone of Saint-Germain’s town centre. It leads to the market place. Place du Marché is at the heart of the shopping precinct of Saint-Germain-en-Laye. The market square was laid out in 1776 on the site of a cemetery. It features arcades and grand buildings such as the Post Office (Hôtel des Postes) edified in 1812. A typical French market takes place on Tuesday, Friday and Sunday mornings. The secretive courtyard of Cour Larcher is accessible through a narrow passageway between 40 and 42 rue de Paris. The old houses were built over vault-roofed cellars. There can be seen the remains of the Maison-Dieu (Charity Hospital) founded in 1225 by Regnault, former archer of King Philip Augustus. Today the courtyard is a peaceful place away from the hustle-and-bustle with restaurants and cafés. The charming little Place Saint-Pierre features Saint-Germain-en-Laye’s oldest fountain: fontaine Colbert. The narrow rue Wauthier has some interesting colourful façades… and yet this is not Provence! The Tourist Office house is located inside the Claude Debussy’s House where the composer was born in 1862. Today a little museum displays Debussy’s personal belongings and historical documents. Claude Debussy (1862-1918) was among the most influential composers of the late 19th and early 20th centuries and influenced many composers who followed. The composer is buried at the Passy Cemetery in Paris. The house dates back to the 17th century. An extra floor was added in the 18th century. The inner courtyard of the property includes a remarkable wooden staircase and connects two buildings. This is a typical feature for 17th century dwellings found in the old town of Saint-Germain-en-Laye. 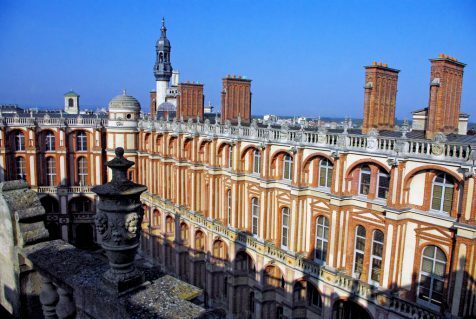 Saint-Germain-en-Laye has kept a great number of Hôtels Particuliers or townhouses built by aristocratic families in the 17th and 18th centuries. Formerly known as ‘Hôtel Mademoiselle’ it dates back to the 17th century. The house was entirely revamped in the 19th century. A plaque above the door shows that it once belonged to Anne-Marie Louise of Orleans (la ‘Grande Mademoiselle’). The wrought-iron balconies were added during the Second Empire. This sober townhouse was built after 1643 and bought by Madame de Maintenon in 1680. The fine wrought-iron balcony was added in 1880. The owner of the townhouse was Nicolas de Neuville, Duke of Villeroy (1597-1685). The building underwent restoration in 1980. Built in the 17th century, this townhouse was built for Henri II of Orleans, Duke of Longueville (1595-1663). The façade was designed with a combination of bricks and stones. Its two levels are topped with a balustrade that hides the roof. Formerly known as Hôtel de la Rochefoucauld, the townhouse was originally built in the 1560s and occupied by the Rochefoucauld dynasty from 1659 to 1763. Entirely rebuilt in 1777, it was again revamped in 1842 and 1983. A small public garden overlooks the castle. It now houses the Town-Hall of Saint-Germain-en-Laye. Before heading back to the RER station, find your way to the rear of the church, on place de l’abbé Pierre de Porcaro. The first is the commemorative plaque of Madame Neuilly who was killed by the Nazi during WWII. The second is an old survey marker which indicates the exact altitude of Saint-Germain (66m above the scale found in pont de la Tournelle in Paris… which in turn is located at 26.25m above sea level!). The third is a vintage Michelin road sign. It was set up there at the time of the Seine-et-Oise département (which has been abolished in 1968 to form new départements: Yvelines, Val d’Oise, Essonne and parts of Hauts-de-Seine, Seine-Saint-Denis and Val de Marne).